This tutorial provides multiple solutions to fix error code 0x800705b4 and tells how to back up Windows system and protect system against damage and data loss. Error code 0x800705b4 usually occurs to Windows update and Windows Defender, and it may cause computer slow down or even crash. Thus, if your computer runs into this issue, do not feel frustrated as you can handle it with ease. DiskGenius – Offers complete backup features help to back up system, partition, disk, partition table, etc. Error 0x800705b4 that happens to Windows computers can be fairly common and the same code may appear in different circumstances with different error messages. 0x800705b4 is hexadecimal data format and it's a common way used by Microsoft Windows to display errors. Computer users shouldn't ignore such errors even though it seems like no big deal. But the final outcome can be the slowdown or crashing of computer or even data loss if it is not fixed. 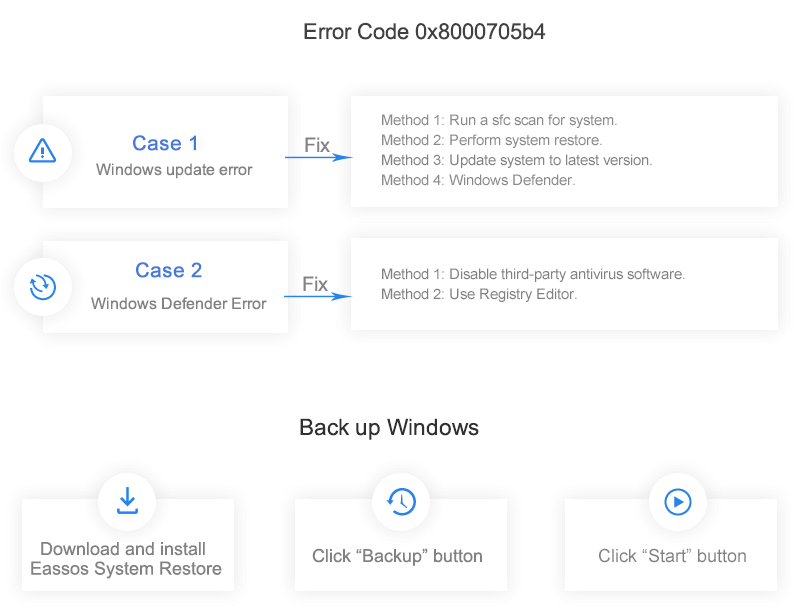 This article gives step-by-step guides to solve this frequently happened error in Windows Update and Windows Defender. The following subtitles are quick links to detailed content. Windows Update (WU) is a service provided by Microsoft and its task is offering updates for operating system and Microsoft products such as Microsoft Office, Windows Live Essentials, etc. Usually, operating system is configured to download and install Windows Updates automatically if computer is connected to the Internet and there are available updates. Microsoft also allows its clients to install updates on computer without connecting the Internet as well other alternative solutions and programs to install updates. Windows updates include several kinds of updates, such as security updates and critical updates that fix system vulnerabilities against malware or security exploits. Other updates correct errors or improve functionality. Occasionally, Windows update can't work normally and fails to install updates. Nowadays, Windows update error 0x800705b4 is no longer a strange problem to many Windows users. This error code often comes together with error message, for example "There were some problem installing updates, but we'll try again later. If you keep seeing this and want to search the web or contact support for information, this may help: (0x800705b4)". A lot of times, users ignore the error and continue to use computer which is not advisable. This Windows Update 0x800705b4 error might become a disaster for your computer. You are more likely to encounter more computer trouble if the error can't be settled by an effective solution. For the purpose of information security and computer performance, you should put an end to the issue as soon as you can. This section gives several methods, please read on. Generally, if you have no clue what to do to get rid of the Windows update error, it's a smart choice to run a sfc for your system. It's a free tool and it is able to fix many common system errors. SFC enables users to find out corrupted Windows system files and repair them. As we all know, once system files are damaged or lost, computer won't be able to perform as well as before. Step 1 Start Command Prompt. Click "Start" button and type "cmd" in the search box and you can see its icon. Right-click it and choose Run as administrator. If you are asked to provide administrator password or confirmation from UAC, enter password and click Allow. Step 2 Now you can see the command prompt where you can type or copy the command "sfc /scannow" and press Enter key. Performing a system restore is really an efficient and wise choice to fix any problem on current system status. System backup is usually completed when Windows was in the groove and freed from errors. Note: backup important files in system partition before restoring system. Besides, if your system has never been backed up, skip this method. System can be backed up by professional programs as well the backup feature offered by Windows. A majority of users prefers to the former one, as third-party system backup software such as Eassos System Restore makes the task easier and more flexible. Eassos System Restore offers 15-day free trial and you can download and follow its backup wizard to backup system, and the ending part introduces how to backup Windows with Eassos System Restore. 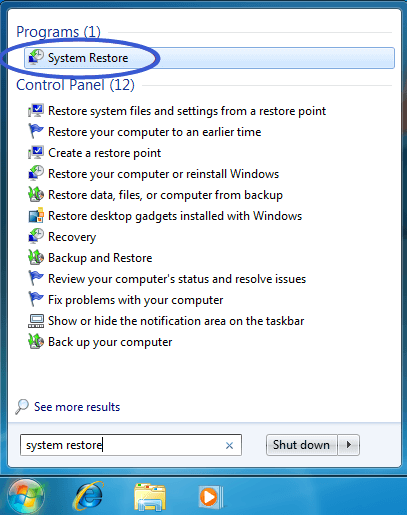 The following part shows how to do a system restore with Window built-in utility. Step 1 Click "Start" button and type "system restore" in searching box. Right-click System Restore in the list of result and choose Run as Administrator. This tool can also be found through Control Panel. Step 2 Choose time point to restore system. Here you can choose recommended restore or specific restore and you can select either based on actual situation. Step 3 Review the restore point and click Finish. Though computer has been set to install updates automatically, sometimes it still fails to do so because of some reasons, for example, bad network connection. In that case, the reinstallation of updates manually can solve 0x800705b4 problem. Step 1 Click "Start" button and select Control Panel. Select System and Security and click Windows Update. Step 2 Click "Check for updates" on the left part of the pane and update Windows to latest system. 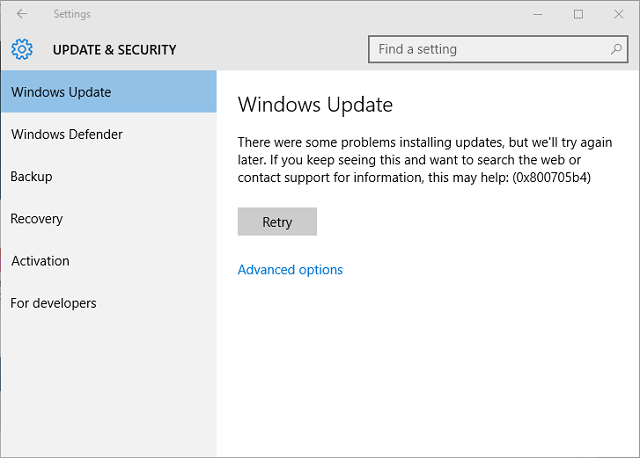 If you are using Windows 10 and facing system update error code 0x800705b4, please try following steps. Step 1 Update Windows Defender from the security center. To locate Windows Defender, click Start button -> Settings ->Update & security -> Windows Defender. Step 2 Go to Windows Updates and click "Advanced options". Click the option to get updates for other Microsoft products. Step 3 Restart Computer and check for updates again. The update process will be done without problem. When you receive the message "Your device is up to date", click "Advanced options" again and recheck update options for Microsoft programs. Step 4 Check updates once more time and now you should become able to get them downloaded and installed. Then update other programs. If you continue to see this error after trying methods above, your problem might be caused by other factors. It's normal that solution to this error may vary from user to user, so I list other solutions found online and hope they can work for you. Try Windows Update Troubleshooter. This tool is provided by Microsoft for free and you can download and run it to fix problem in Windows update including Service Pack. It has on-screen instructions for users to follow and it's able to identify and fix existing problem automatically after being launched. Disable Windows Defender, firewall or any third party antivirus software and then retry system update. Disconnect any non-essential devices, such as webcams, printers, USB flash drives, unless there are updates for these devices, and then run Windows update again. Windows system offers users one built-in protection tool – Windows Defender, which is designed to provide real-time protection for computer. It is one of the useful tools provided by Microsoft and most of times it works effective as described. It's freeware to protect system from external threats such as spyware and malware and it is a good alternative of additional third-party software to protect computer. However, no software has the exception to be free from bugs or errors. There are many cases that Windows Defender fails to start or scan system and gives different error messages. These messages often appear with numeric code such as 0x80070002 and 0x800705b4. 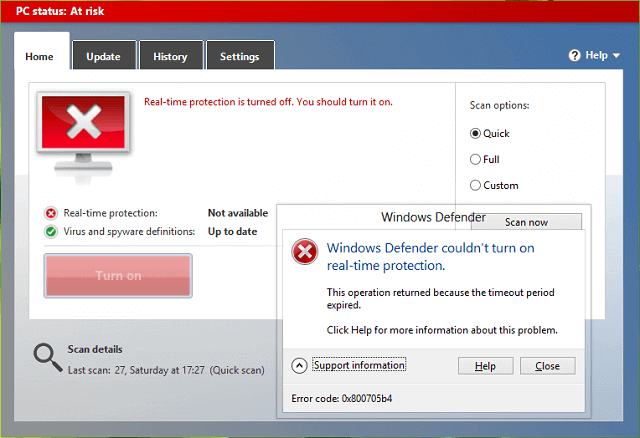 0x800705b4 is one of the most frequently happened errors and it causes Windows defender to stop and give error message: "Windows Defender couldn't turn on real-time protection. This operation returned because the timeout period expired. Click Help for more information about the problem. Error code: 0x800705b4". Your computer has installed some third party protection software which is not compatible with Windows Defender. The conflict between these two tools leads to the error. Registry is missing or corrupted, system drivers are outdated or Windows is not updated. There are cases that computer reports 0x800705b4 because settings of Windows are lost. Windows infects latest virus or malicious software and system becomes unable to use the tool. The error stops Windows Defender from working flawlessly and facilitates virus to penetrate. Hence, it should be fixed to assure system a secured environment. A number of solutions can be used to get rid of the error due to causes vary from user to user. This part gives two most commonly recommended solutions. Step 1 Disable or uninstall third party antivirus temporarily. You can go to software's official site to look for detailed manuals. Step 2 Keep Firewall turned on. If you have both third antivirus software and firewall installed on your computer, you should make sure Windows firewall is enabled. Next on the left sidebar of the window click Turn Windows Firewall on or off and click Turn on Windows Firewall on next pane. Step 3 Start Windows Defender. Click Start button and type Service in search box and right-click Service from search result to run it as administrator. In the Service window, search for Windows Defender and set it as Start. Step 4 Restart computer to make these settings take effect. Step 1 Open Registry Editor. Press Windows key + R key and enter regedit and press Enter. If you are prompted by UAC to give confirmation, click Yes. Step 4 Restart computer and Windows Defender will back to normal working status. To many computer users, nothing will be worse than system gets damaged and you have to reinstall it. During that process you have to spend a lot of time to reinstall system and drivers for hardware, download and reinstall programs you often use, reconfigure system settings, reload personal files, etc. If you don't want to undergo this, you should keep a system backup. It has always been being suggested to create a system image for your computer in case of system problem or crash. The image file should include all data of system partition, such as Windows, system settings, installed programs and files. The system image is supposed to be stored in a location which is separated from system partition, so that it won't be affected when system goes wrong. Having a system backup image, you can restore system when your system slows down or can't work smoothly. How to backup windows? 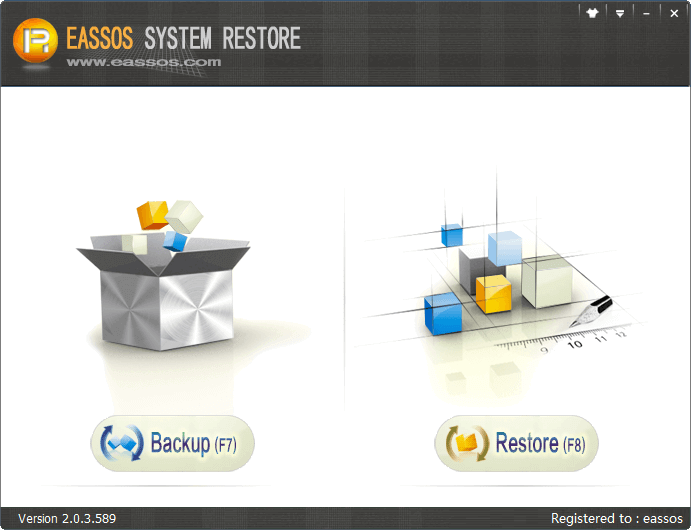 Eassos System restore, easy-to-use system backup software, is designed to complete system backup within several clicks of mouse button. This program has an intuitive wizard for backup & restore process, which can be used by both expert users and beginner users. Step 1 Install Eassos System Restore and its boot options to your computer. Step 2 Launch the backup software and click Backup button from the main interface. Step 3 Click "Next" button to start backing up system. Before that you can click "Options" to configure advanced settings, such as where to store the system image, how to compress the image files, set password, etc. If you don't know what to do with these options, you can follow the defaulted settings. DiskGenius provides all-in-one solution to data recovery, disk partition management, data backup and disk utilities. You can simply use it back up Windows system, non-system partition, disk, files and folders, partition table, etc. It is also an efficient cloning program that is able to clone entire disk or partition. 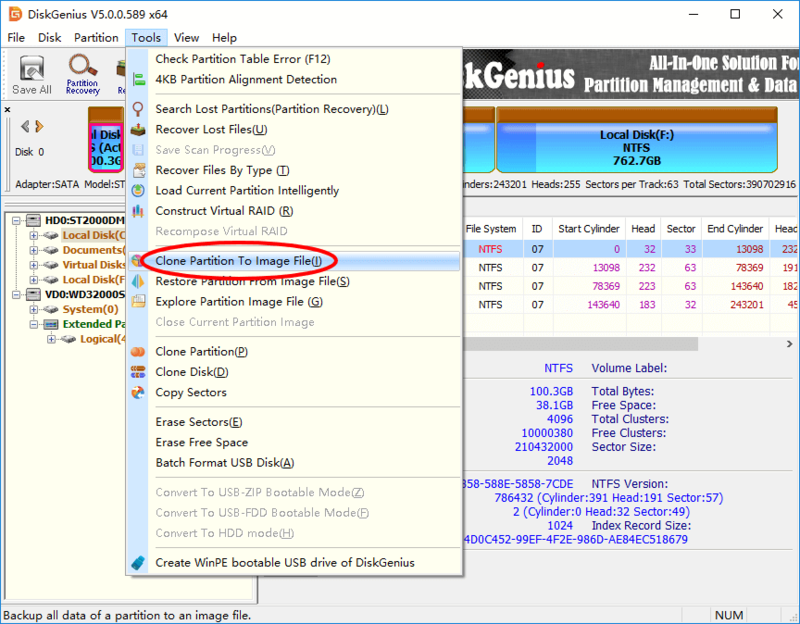 Here is how to backup system partition with DiskGenius. Step 1 Install and launch DiskGenius from your computer. 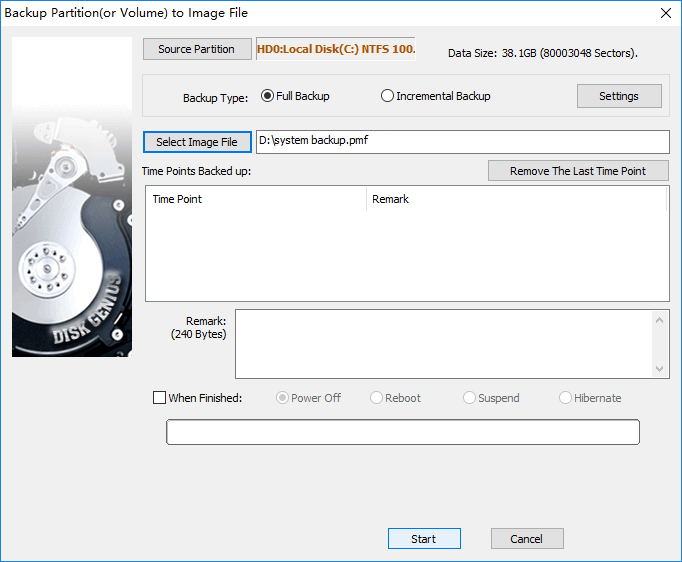 Step 2 Select system partition and click "Backup Partition" button from toolbar, or click "Tools" and select "Clone Partition To Image File", as below. This opens partition backup window. Step 3 Click "Select Image File" button and you can choose a location to save backup image as well as set a name for the image file. Step 4 Click Start button and give confirmation to operations to be done, and DiskGenius starts to back partition to an image file. Wait for the process to complete. DiskGenius – Manage disk partition, back up data and recover file to keep your PC running at its best.